Is it alright to pre-treat cotton with soda ash, dye with a Tulip kit and use Retayne after? 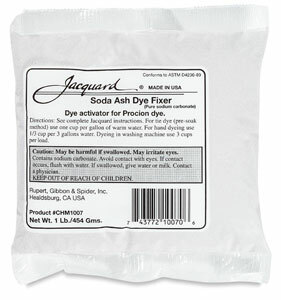 Soda ash fixes Procion dyes to cotton, rayon, or silk at room temperature, with no need for hot water. Already included in good tie-dyeing kits. Message: Is it alright to pre-treat cotton with soda ash, dye with a Tulip kit and use Retayne after? Will doing so help set and keep the colors fast? Does Tulip really have soda ash in the dye powder? It is not a bad idea to pre-treat cotton with soda ash before dyeing it with a Tulip kit, even though the dyes are pre-mixed with everything but water. The package of Tulip brand soda ash says on the label, "Use Tulip Fashion Dye Soda Ash to pre-treat all of your dye projects for optimal color results!" Although soda ash (sodium carbonate) is the best choice for use in tie-dyeing kits, the Tulip tie-dye kits claim on their label to instead contain sodium bicarbonate, which is baking soda; if this is true, then a soda ash presoak will help, because it produces a higher pH which is more suitable for the fiber reactive dyes in the kit. I strongly advise you to use a much cheaper brand of soda ash than Tulip, though. One four-and-a-half-ounce package of Tulip soda ash costs $6.49 and contains only enough to make two one-gallon batches of soda ash presoak. In contrast, a 4-pound package of 99% sodium carbonate, which is the same stuff, costs less than $10 at a hardware store or pool supply store and will make more than twenty batches of soda ash presoak. It is sold under the name of "pH Up" or "pH Increaser", but be sure to check the fine print on the front of the label to be sure you are getting sodium carbonate and not sodium bicarbonate. In spite of its price, the Tulip brand soda ash is not superior in any way to the much cheaper hardware store product. You can also buy soda ash by mail-order from a good dye supplier, or use Arm & Hammer brand washing soda from the grocery store. 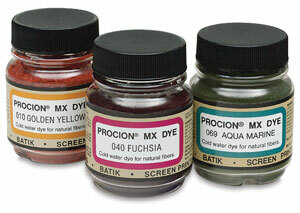 Incidentally, it is better to order Procion dyes from a good dye supplier, such as PRO Chemical & Dye or Dharma Trading Company, than it is to buy Tulip dyes, which are more expensive per use, and not always as fresh. There is no need to bother with Retayne or another cationic dye fixative if you use soda ash with the fiber reactive dyes in a Tulip tie-dye kit, or any other brand of tie-dye kit that contains fiber reactive dyes. Retayne is very helpful with poorly washfast dyes, such as Rit all-purpose dye, but it is not needed for fiber reactive dyes that have been properly washed out. Fiber reactive dyes form a much more permanent bond to the fiber than Retayne does. One added side note, however: when you apply any dye, you should be sure to put on what will look like too much dye before you wash it out. There is always quite a lot of unattached dye present after the dyeing process is completed, which will have to be washed out, so the true color will turn out to be lighter than what you see while you are applying the dye. This does not mean that the remaining dye is less permanent.